360 degree view of your customer. Easily Manage Customer and Money. 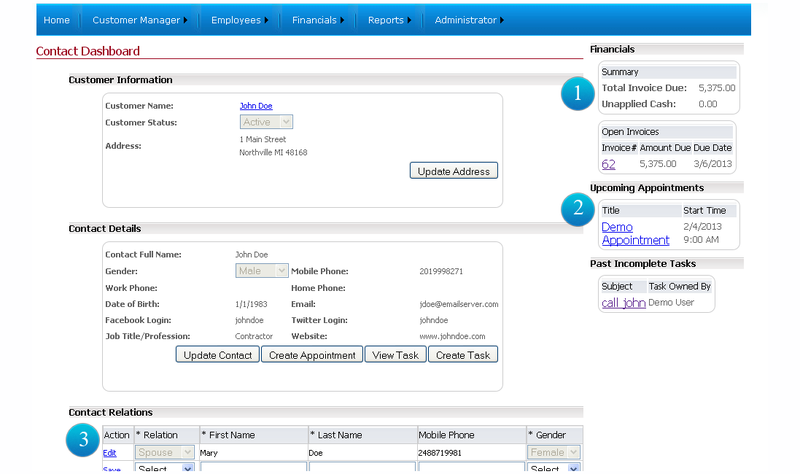 Customer dashboard that shows open invoices, notes, upcoming appointments, and tasks! Contact dashboard shows total amount that the customer owe, and any unapplied cash that you may have on customer's account. You can also access all open invoices from the dashboard. Shows any upcoming appointments that you may have for the contact, saves a lot of time searching through your calendar. Any open tasks that you may have for the customer will be shown. Spouse, Son, Daughter or any other relationship that you wanted to maintain for the contact can be stored.